Thinking of visiting Reno? If so, you’re sure to find it a fascinating place. Nicknamed “The Biggest Little City in the World,” Reno is the largest city in northern Nevada. But how did it get this nickname? The answer lies in the Reno Arch. The Reno Arch is a downtown gateway and famous landmark. The city held a contest to establish a slogan for the city arch. 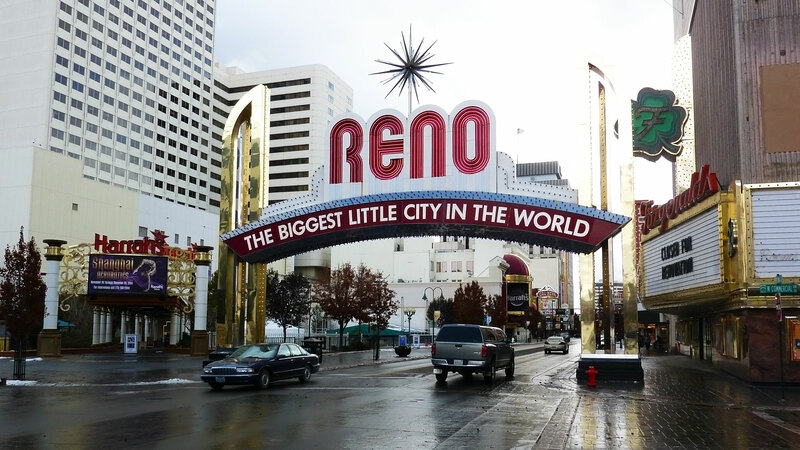 G. A. Burns of Sacramento won $100 for successfully naming it “Reno, The Biggest Little City in the World.” In June of 1929, the slogan was first displayed on the arch. There have been many revisions of the arch over the years, with the most current one installed in 1987. There are many things to do in Reno. Most popular are visits to the various casinos in town. But many of the casinos offer more than just gambling. The Circus Circus Reno Hotel and Casino is where you can watch JR Johns and His Hilarious Hounds perform. At Harrah’s Reno Hotel and Casino you can play Beer Pong and win up to thousands of dollars in prizes. While at the Silver Legacy Resort Casino, you can watch the world’s only indoor mining rig. And these are just some of the many casinos you can enjoy while visiting Reno. Another big event in Reno is Hot August Nights. It’s held each year in August and is one of the leading car shows in the western United States. At this event, car enthusiasts showcase their cars in the leading hotels in Reno. Here, you can see a wide range of automobiles, such as classic cars, modified cars, muscle cars and concept cars. Also, there are exhibits, concerts, contests, drag races and much more. Believe it or not, there are great outdoor activities available in Reno as well. Stand-up paddleboarding has become so popular that in 2010 the Reno River Festival added this sport to the event. You can also spend time in the Truckee river fly fishing, kayaking or rafting. It’s also a great venue for taking a riverside walk. The Riverwalk is a 1.5 miles long district in Reno featuring a 12-mile pedestrian path. It connects two urban whitewater parks and has been to known to be one of America’s greatest river walks. There a also a number of interesting and fun things to do nearby. You can visit historic Virginia City. It’s an old mining town that is now a historic attraction. Mark Twain once worked here for the local newspaper. There is the beautiful Lake Tahoe area, just minutes away. Here, you can go boating and enjoy a wide range of water activities in the summers and ski on various sky slopes during the winters. Planning a mainland road trip or want gamble in a city other than Hawaii’s 9th Island of Las Vegas? If so, Panda Travel ® can help you plan your next trip to visit the Biggest Little City in the World, Reno, Nevada.